Valentine's Day reached its height of celebration in the Victorian Era. Valentine cards were more cherished that Christmas cards (which weren't printed commercially until 1846), perhaps because of the sentimentality attached to them. Due to this popularity, designing cards became a highly competitive market, with a vast array of motifs and verses. Suddenly, cards were being produced in tens of thousands, from whimsy and slightly vulgar, to truly sentimental, their designs included lace paper, embossed envelopes, glass or metal mirrors, ribbons, dried ferns and fake advertisements, bank notes and marriage licenses. 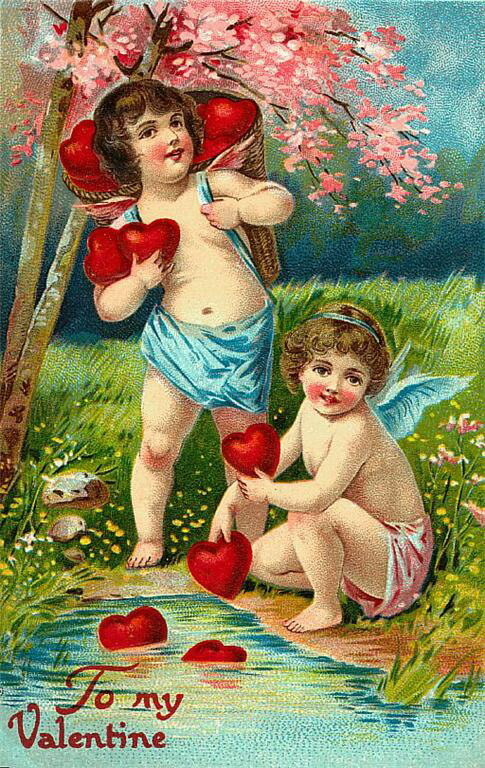 Valentine cards were so popular that their production became a flourishing trade amongst cheapjack printers in central London. Commercially printed valentine cards quickly superseded home-made offerings of earlier times. They reached the height of their popularity during the 1870s and 80s. Yet even though they were mass-produced, they still featured birds with real feathers, posies of dried flowers and spun-glass hearts, all trimmed with ribbons and gold lace. Some valentines were so thick with embellishments, they came in presentation boxes. Some unfolded like fans, while mechanical valentines had levers or disks which made figures dance, hands move and birds flutter their wings. But as times changed, so did customs. And as less became more on the advent of World War I, valentine cards became a dying art.